Patient records are a combination of medication information, documents, reports, patient history – and also typically images, both DICOM images, e.g. radiology, as well as non-DICOM ones, which could be dermatology pictures or other pictures of a patient. The problem is that all those types of content are spread over different systems and in different formats. For a doctor, that can be very frustrating, because to get a complete view of the patient he often has to go to different systems, to get to what he needs to know about a patient. That is not ideal. Doctors are starting to say, ‘Just give me one way of looking at an entire patient record, including radiology images, cardiology, dermatology and medication!’ Because that is a lot easier, clearly. I hear from a lot of medics that they only have a few minutes to talk to a patient during a consultation – and if they have to log into three or four different systems, it’s unmanageable and they won’t do it. They have to ask the patient ‘Please tell me what kind of medication you are using,’ and ‘Can you bring me a CD with the back X-ray images’. Information should be simple to access and available, in one place. That is the marketplace demand we are seeing more and more of. The reason we’re at this point: silos. Historically, each and every department in a hospital had their own ‘silo’ of information. They all had their own database with information that had to do with their specialisation. There’s another IT aspect to this to consider. 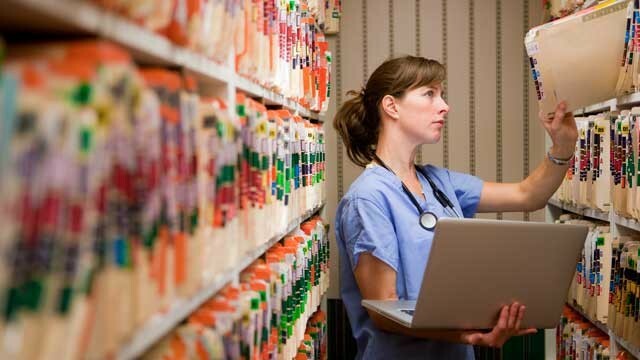 Hospital IT departments are buying more and more archives/storage from different vendors. They have to go to one particular company for storing their radiology data, then another for storing the cardiology information, then to another for storing the medication information etc. The problem that results from that is that it is very difficult to keep everything in line. They would like to have just one system where everything is stored about a patient. The good news is that with more modern systems, especially VNAs, we are getting to a more integrated view of the patient, driven by the doctors, who want everything together. In the UK, there has been a drive to create a unified patient record, and there is an NHS paperless target for 2018. What’s interesting is, this ambition is far from being a UK-one only – it’s European wide, although manifesting itself differently in different countries. Finland has, for instance, said it wants one integral view of the patient, with everything digitised in a centralised way, so it is setting up one central system where all hospitals are required to send important data, then any other hospital or any GP can access it, even the patient. The goal is to get rid of paper and see the end of patients running around with CDs or documents if they visit another hospital. In The Netherlands, they are also trying to digitise everything – however, here there is a completely non-centralised approach. Each hospital is individually aiming for digitisation, then connecting to all the other hospitals so that, with all kinds of protocols and security, each hospital can look into the data of the other. Estonia is also following the Finnish centralised route – which we’re helping by implementing one integrated viewer for all images, across the country; we are also doing a project in the region around Johannesburg (South Africa), which is following a centralised approach for 30+ hospitals to share patient-data. In England it’s more of a semi-centralised approach, which is closer to the Dutch model. This entry was tagged J4Care, VNA by Carina Birt.